He is fun to drive around (I like to drift between the legs of my coffee table). He is water proof. He is full of amazing tech. And he’s a ball!! He’s a ball that moves around on his own! Of all my robots, I think my 4 year old niece has played with Sphero the most. That gets a big positive vote from me. One of the cool things about Sphero is that he has lots of great apps – from AR games to educational apps that teach kids to program. 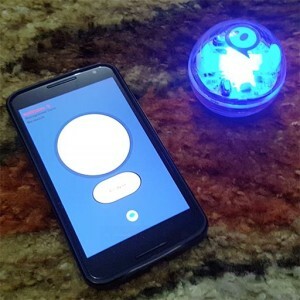 One of the COOLER things about Sphero is that the makers of Sphero provide SDKs to enable us to make our own Sphero apps. I wanted to take the things that I learnt from making MobBob to creating a fun, interactive Sphero app – one where Sphero is your robotic companion! This video is a demonstration of where I am so far. I’m really happy with how it’s taking shape! I’m going to add more functionality this weekend and then release it for other Sphero owners to play with. Previous PostWhat the world needs… is another blog!Next PostI’ve updated my Sphero Companion app! I sideloaded com.cevinius.SpheroCompanion-1.03.apk to a Kindle Fire HDX 7″ and the program will control the ball, but when the “listen” button is pushed and the app goes into “listening mode,” there is no speech recognition. The ball still responds to the controls. The microphones are working because I can use a recording app. I would purchase this app if it worked on a Kindle Fire and/or Windows Phone. Are you online? The speech recognition will only work if you are online. If you’re internet access is slow, sometimes it takes a while for it to respond. The speech recognition is using Google’s libraries. Do other speech recognition things work on your device? E.g. Can you do voice search using Google Now? can you pls update your app so it will work with sphero sprk+? Would it be possible to update to work with sphero star wars driods and force band. I would also very much enjoy tasker integration so that I could then tie my sphero’s and Sphero R2 D2 in with my home automation. Imagine how fun it would be to have R2 or bb-8 meet you at the door when you came home. I haven’t done Sphero development for a while, and it seems Sphero has shifted focus away from supporting external people who want to make apps for their products. I’ll have a look into it.